When a disaster such as a fire, flood, or even vandalism strikes, Contact us right away. We will help walk you through the logistics and disaster response actions required to secure your property and minimize the losses to your home or business. Damage to your home or office building can turn into a bigger headache if not properly addressed. It is essential to secure your property from theft, or the liability of an unauthorized person entering and injuring them-selves. Our emergency repair services focus on minimizing further damage or preventing other issues such as theft. 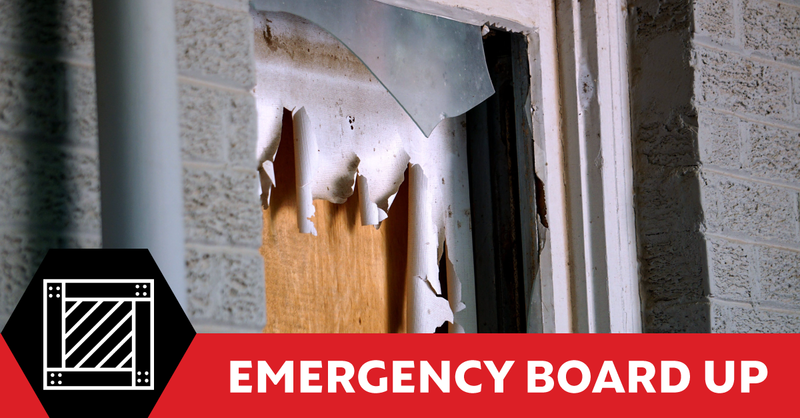 Our quick response team will contact you within 15 minutes and be at your property within 2-4 hours to start the emergency board up process. Board up services need to be done quickly and efficiently to protect your business, home, or any valuable assets. 24 hours a day, 7 days a week, our experienced board-up team at CD Restoration are available to come out to your home or business and take care of your emergency board-up requirements. We are here to help protect your home & business.